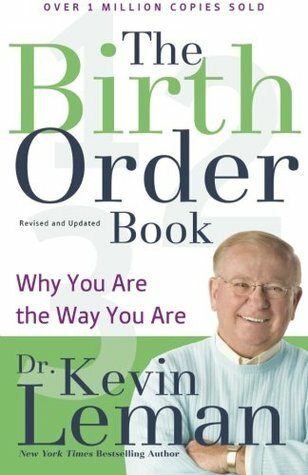 From Goodreads ~ Dr. Kevin Leman's ever-popular book on birth order is getting a new look and updated writing. With insight and wit, Dr. Leman offers readers a fascinating and often funny look at how birth order affects personality, marriage and relationships, parenting style, career, and children. Birth order powerfully influences the way people interact with others, whether they're at home or on the job. This book originally came out about 20 years ago. I read it then and thought it was interesting. My sister recently read it so I thought I'd reread it. Have you ever wondered why you and your sister or brother are so different, even though you grew up in the same family and had similar childhood experiences? Why do you get along with some people and not with others? Why do you act the way you do? Why you pick the friends you do? Who should you marry? What job is best for you? This book might answer some of those questions. Gord and I are both first borns, which isn't supposed to be a good combination. I can see why the author would say this but as a first born I can understand why Gord does some of the things he does sometimes. Supposedly first borns and last borns make the best match. The first born teaches the last born things they may be lacking like being organized and having goals while the last born helps the first born lighten up and not take an overly serious approach to live. I don't know if I would have the patience to be married to a last born. Ha! I like the writing style. The author gives lots of example from his own life and those of his clients.